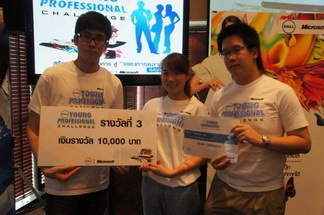 Dell Young Professional Challenge 2011 is a competition organized by Dell Corporation Thailand and Microsoft Thailand for junior and senior university undergraduates. This event provides an opportunity for students to apply both their academic and creativity skills, as well as to increase their knowledge and to obtain real world experience. The competition started with a training and workshop activity set up by Dell and Microsoft in August 2011. After that, we had roughly a month to submit in a business plan for Dell in groups of three persons. In the top ten finalist teams, five of them were BBA Thammasat students. We had to work under the topic of developing a business plan to "create a group of DELL lovers through the use of digital marketing". For this we had to create a website or a Facebook fan page to implement our marketing plan. Furthermore, we were assigned to apply our creative ideas into the real world by having a one day test at Dell Concept Store at Pantip Plaza. Posted date: January 24, 2012 � 10:00 hrs.